While designing new student housing, Hewitt found an opportunity to turn East James Court into a woonerf and a vacant lot into a pocket park. 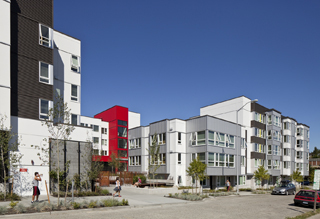 Class has begun at Seattle University, and students are breaking in their newest apartment community, The Douglas. Completed last summer, this sleek, modern, healthy building represents a fresh spin to the traditional student dormitory. A public-private collaboration between the university and developer Seneca Group, The Douglas is located at the edge of campus and in the heart of the 12th Avenue neighborhood. The site, a former fuel station and brownfield, and the building reclaim an urban blight and offer a chance to expand and enhance the pedestrian experience for the community. Hewitt’s design for The Douglas is a C-shaped building opening at the south with retail spaces at street level facing busy arterials and a central courtyard facing adjacent residential neighbors. Traditional student life spaces overlook and revolve around the courtyard and terrace and serve as an extension to the future James Court Woonerf and Park. Fully furnished student apartments occupy the top four floors, with one- to five-bedroom units offering communal living rooms, kitchens and bathrooms for every two students. A future woonerf and park will face The Douglas’ central courtyard. The Douglas provides widened sidewalks, an active environment, special paving and abundant planting along the residential edge. It has a strong pedestrian orientation that allows easy walking connections and serves to activate the space for all. As the building form took shape, Hewitt recognized an opportunity to visually expand the boundaries of the project, engage an under-used street and activate an adjacent empty lot. In tandem with the design team, the 12th Avenue Stewardship Committee and city of Seattle envisioned this as a chance to provide open space for an underserved community. The Seattle Parks Department purchased the empty lot to provide a pocket park and Hewitt’s Landscape Architecture studio was selected to design it. As design began, it became clear the stewardship committee and the team were committed to developing the adjacent street, East James Court, into a woonerf. Hewitt worked with the group to write a proposal for the woonerf. The park project was put on hold while awaiting approval and funding. The woonerf was approved due to meeting city funding criteria; it will provide open space to an underserved population that is rapidly growing and lacks parks. This created a rare opportunity to have all three elements designed and implemented by the same design team, allowing for a high level of continuity and connection. The Douglas benefits with an expanded sense of place and an enhanced forecourt for its residents and retail tenants. The neighborhood residents benefit with a focal point, community gathering spot and benchmark for other similar streets. For the city, the decision to create a woonerf  Dutch for “living street”  resonates with Seattle’s idea of complete streets. Reshaping the public right of way, space the city already owns, into a community resource and at the same time creating a safe and accessible environment is a powerful idea. As the city continues to grow and densify its urban centers and villages, the need for open space will continue to grow. Woonerfs are one model for complete streets, giving pedestrians and bikes priority over cars. These projects are a demonstration of what’s possible. After construction started on The Douglas, the park and woonerf design resumed with strong momentum. The design team met with the community and city to explore possibilities, listen and find out what their vision of open space meant for this site. Their answer: an active, safe place that celebrates their unique community. The design team, including local artist Ellen Sollod as design collaborator and KPFF Engineers, began by reviewing the parameters of the park and right of way, looking at vehicle access requirements, community needs, adjacent uses and construction budget realities. The project edges were examined to clarify what could be done within the framework of the street grid and the fabric of the neighborhood. What emerged for the integrated park and woonerf was the idea of two rooms: an active “harder” plaza to the west next to the busy arterial street with more public/commercial interaction that transitioned to a “softer” garden on the quieter residential side to the east. The design team developed an iconic site element for the park that represented the neighborhood. The “Cloud,” as currently conceptualized, is a floating canopy of stainless steel mesh strung with convex mirrors that will serve as a focal element in the park. The passage of stormwater acts as a unifying element between the three projects. The rain gardens at The Douglas weave like a necklace through the site, leading you through the courtyard, the woonerf and into the park. Roof water is collected in an expansive rain garden system, where it is detained, filtered and slowly discharged to the municipal sewer. The woonerf and park reclaim over 5,000 square feet of street, sidewalks and other impervious cover into pervious green space. The stormwater infrastructure will detain and filter water on site, slowing its journey to the city sewer system, which in the past has been known to flood the intersection of East James Court and 13th Avenue. Special effort was placed on blurring the edges of the park and the woonerf. The design language of the integrated site is a meandering flow, reminiscent of water, with crisp edges and a soft center. Ultimately, the design should provide a safe, welcoming and flexible community amenity that is both responsible and memorable. When complete in the fall of 2012, the park and the woonerf will complement each other and bridge a connection to The Douglas. What makes these three projects unique is a shared vision of the city and a private developer for green infrastructure, street calming and pedestrian-oriented design. Taken as a whole, the projects exemplify how other developments and small-scale streets can be part of the green infrastructure and contribute to a healthier city. Matthew Porteous, ASLA, and Jake Woland, ASLA, LEED AP, both focus on projects in urban public spaces. Porteous is an associate and Woland a project manager at Hewitt. Shammara Estrada, CPSM and Hewitt’s marketing manager, contributed to this article.